RES (Recycling Entertainment System) Turns Old NES Controllers Into A Multi-user Instrument | OhGizmo! Part instrument, part eco-friendly way of reusing old electronics and part hippy-inspired commentary on waste, Benjamin Gaulon’s RES or ‘Recycling Entertainment System’ uses repurposed NES controllers as the inputs for a multi-user music experience. The controllers are all connected to a central hub which in turn is connected to a computer running software that triggers various music samples based on incoming MIDI signals. So in essence each controller is its own virtual instrument, turning the famous Konami code into something worthy of Beethoven. 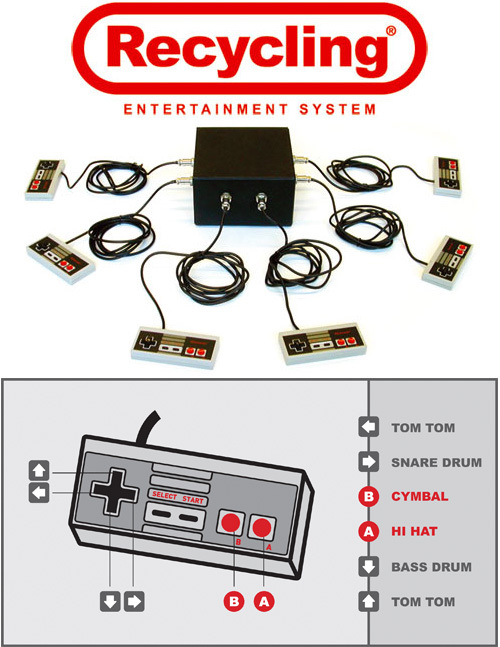 The Res uses six Nintendo Entertainment System’s controllers [containing MC 14021 BCP chips] that are connected to a main chip [Atmel Mega 16 programmed in Basic] which reads and converts the signal from the controllers to midi. The midi output from the Res is connected to a computer that runs the Resware, a Max/Msp midi based software. Each controller is playing with a different sound bank, so players can mix like Dj’s and play as a group, like a band.